Now 12 years old , we decided that it was time the tractor had a full strip-down and check. We started with the rear axle and replaced all the bearings & seals. Now with this in good shape the discussions started as to what would be the most cost effective way to spend our budget to make the biggest gains up the track. 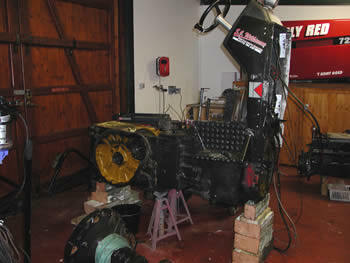 It was decided that the wisest thing to do first would be to strengthen the engines bottom end. 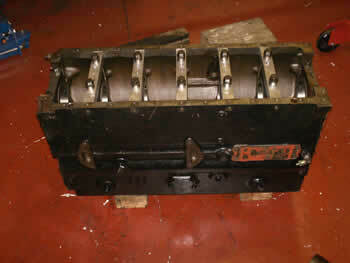 This entailed buying a girdle from the USA and having the block machined and lined bored to fit it, considerably strengthening the crankshaft bearings in the block. Next we purchased a Hypermax camshaft from the Rough Justice Team along with new main bearing & conrod bolts, and a rev kit direct from Hypermax in the USA. We next decided to obtain some better manifolds. The Just Smoky Team have been getting some great ones made so we went for these. 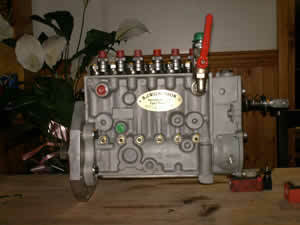 We next had the fuel injection pump modified, kindly by SJ Wilkinson Diesel Injection. Chris Wilkinson has helped us a lot with the fuel system and we are very grateful for his expertise. We finally decided that with the increased power from the engine mods it would be good to have some new rubber to get it onto the track. So we orderd a new set of aluminium rims from Midwest Wheels USA , and a new set of double cut tyres from Peter Clarke. Now with a lot of late nights, and we were ready for the 2007 season to start.